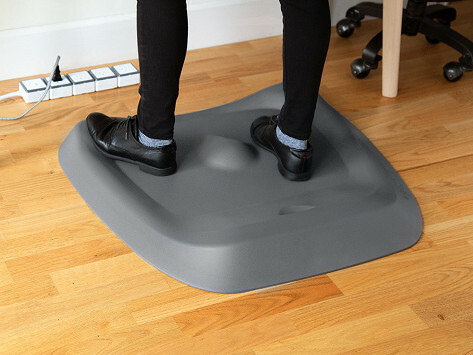 This cushiony standing desk mat has a variable surface with bumps, lips, and curves to keep feet and legs busy throughout the day. The small movements you make can help fight fatigue, stiffness, and achiness associated with standing. And because the movements are subtle, you might not even notice you’re moving while you’re at work. Dimensions: Small: 25.2" x 19.2" x 2.4"; Large: 29" x 26.25" x 2.7"
Weight: Small: 4 lbs. ; Large: 8 lbs. The different foot positions keeps me moving all day. Very comfortable on my feet, legs and hips. I have only had this mat for 2 days and I LOVE it! So many different foot positions are avaiable. 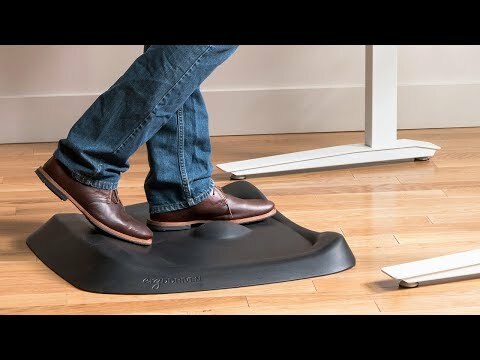 The Topo standing desk mat was created by two standing desk enthusiasts who wanted a better mat—one that would fight the achy and tired legs associated with being on your feet all day. Kit Perkins and Ryan Feeley both enjoyed standing while working, but felt that typical flat mats didn’t deliver any fatigue-fighting relief. So their mat, Topo, is, firstly, not flat. It has a variable surface with bumps, ridges, and curves that keep you moving while standing. This helps fight stiffness and aches in legs and feet, and because the movements are subtle, you won’t get distracted while you’re at work.